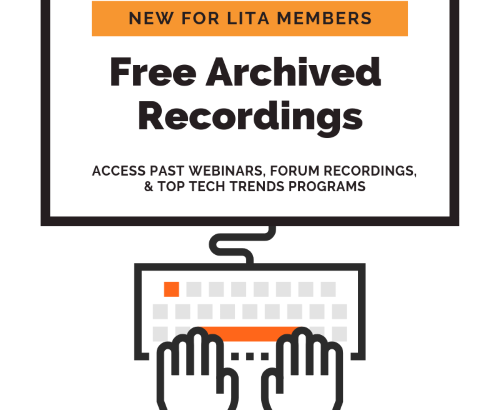 The LITA Board recently voted to make webinars older than one year available for free to all LITA members, so we’ve begun posting recordings in the LITA Members community in ALA Connect. Once you’re logged in using your ALA username and password, you can browse to the community’s library of files or just go directly to the folder for archived webinars. Each year we’ll add the previous year’s recordings. Going forward, we also plan to archive recordings from our popular Top Tech Trends programs at the ALA Midwinter Meeting and Annual Conference. The 2018 TTT sessions from Midwinter and Annual are already archived in the community. In addition, audio recordings are available from nine of the sessions held at the 2018 LITA Forum. Attendees also took publicly-available collaborative notes in Google Docs to provide additional context, and many presenters shared their slides and handouts. While some of these non-webinar recordings are available to anyone, members will always be able to easily find links to all LITA recordings by checking the LITA Members community library.